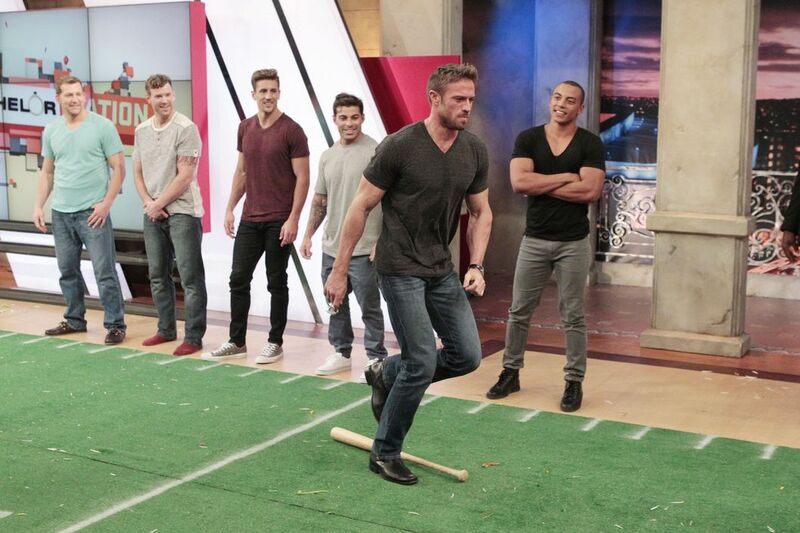 The group dates start this week on The Bachelorette, and so do the hijinks. JoJo was saved from a burning building, insulted by a Chad, and flown to the Golden Gate Bridge. Chelsea, Alisa, and Rae have some thoughts. Let’s talk about Chad. What do you think? Chelsea: Chad is the definition of toxic masculinity, and the producers are playing him up so hard. I cringe most of the time he’s on screen and am ready for him to get the boot. He was becoming too much during the episode and I would’ve liked to see more of the other guys. I think he’s gonna go during the two-night event next week, probably on day two. You can only keep a villain so long before people get tired of him, and I, for one, am already tired. Alisa: Chad is a conundrum. On the one hand, he’s completely deplorable. On the other hand, he’s been flinging truth bombs at everyone within a bachelor mansion-radius since he arrived. He’s completely right when he calls out the guys for gushing all over JoJo, a woman they met about five seconds ago. But he does it in such a toxic way that it renders whatever truth he has to say completely worthless. Plus, this is a “reality” dating show. This is how it goes. Did you think you were going to come on here and educate America on how true love is supposed to work? Because that’s not why we tune in to this show. I agree with Chelsea that he’s gonna go next week. As he should. Villains can only vil for so long. Even on reality TV. Rae: Yes, I agree with all of the above. The point of the games on a group date is to be nice to JoJo — obviously JoJo doesn’t think all of those men are actually in love with her. So to use that to paint everyone else as crazy and yourself as the only man with any integrity because you refuse to say something nice about your date is pretty insulting and rude. Guys like Chad know how to twist the situation to put everyone else on the defensive. Remember how he said he didn’t know any confident women? That’s because he chooses to surround himself with insecure women because it’s easier to pull this off with people who don’t trust themselves. I loathe Chad. I am, however, sorry for his loss and sad that his mom died because I am still a human person. To me, that sort of explained what he’s doing on The Bachelorette — after a big loss, I could see a person wanting to shake up their life a little bit and not want to lose out on love. But grief is not a license to treat people like trash, and it seems like Chad’s issues go way deeper. He reminds me of Tony the Healer from Kaitlin’s season. What is it about men who feel the need to play it cool and remind everyone that, hey, they don’t even know this girl yet, so she’s not that special? They act like the bachelorette has to prove herself to get these guys to stick around. I agree that for a relationship both people need to figure out if they actually like each other, but Chad, I have news for you: JoJo doesn’t need to prove her worthiness to you, and she’s got guys lining up to take your place. I also think the two-night event next week will end with Chad leaving the show. At least that’s what I’m hoping. What do you think about the group date activities of firefighting and competing at ESPN? Chelsea: I thought they were cute but nothing special. You can tell the show wanted to take Jordan down a notch because he came out of the gate too strong on week one. The whole date spiraled into "let's attack Chad," and while I loved the guys being honest about him being a jerk, it just gave him too much attention and let him play victim. He makes me miss Olivia. Alisa: Okay firstly, Chelsea’s comment about Grant insulting Harry Potter just made me race to read his bio and now I hate him. Grant, I thought we had something, but no. As for the dates, well... I always find the group outings so cringeworthy. There are often tears, someone always gets injured, and there’s a lot of moping and whining from the losers about how they should have won whatever sordid competition was set in front of them this time. It basically reduces everyone to the maturity level of high schoolers. I get why group dates exist. You can’t go on one-on-ones with everyone. But I just wish the group dates still centered around something a little more normal, so JoJo could get to know what these guys are really like. Fighting fire is a great way to show off the guys’ muscles, but I don’t know that “rescuing” her off a rooftop is really something that equates to anything that will actually happen in her impending five-month engagement to whomever wins. Rae: I was really gunning for Grant to win that firefighter date because I want to believe that firefighters are the best at being firefighters. I am not surprised that a veteran came in second place. I feel like both of these group dates are very stereotypical manly men dates. Maybe it would be more fun to make them try knitting or cook JoJo a meal? Better yet, get them to do all of your laundry to see if he’s really a keeper. I don’t think “most athletic” is the number one quality I’m looking for in a date, but I guess the group dates do reveal who plays nice with others. And Wells almost died for JoJo. That’s gotta prove tenacity at least. If you were planning a Bachelorette date, what would you do? Chelsea: Popcorn. Cookies. Pasta. DCOMs in a movie theater. Contestants would win that date with me after a DCOM competition. They’d have to guess my top three DCOMs, then the top three winners of that would advance to the second part of the competition, which would be DCOM trivia. I’m all about that romance, y’all. ... Or a picnic in the park and playing with puppies. Alisa: Harry Potter trivia night (that one’s for you, Grant). But seriously, a night in with a stupid-silly comedy, board games, some popcorn and definitely puppies. Rae: Alisa, Harry Potter trivia is the only trivia I have ever done well at. I would so much rather go on Chelsea and Alisa’s group dates than any the Bachelor franchise that have ever had. A movie marathon sounds fun, or volunteering at an animal shelter, or, I don’t know, a game show? They should have a Bachelorette Chopped. Bonus question: You have one group date rose to give out, who gets it? Chelsea: Wells is already winning this for me. He’s my type of person, as I too could not do strenuous exercise or fight fires. He’s a cutie and he tried. Big fan. He’s number one in my heart even if he’s not perfect for JoJo. Alisa: I still adore Christian. He’s silly and smart and seems to have a really big heart. And I totally didn’t mean for that to rhyme but I’m gonna embrace it because Christian is worthy of poetry. And puppies. And roses. Really, all the things. Just give Christian a puppy wearing a collar made of roses and holding a love poem in its mouth. Rae: Oh, boy. Who was the boy who made it snow? I thought that was cute, I'd give my rose to him. You know what else was really cute? When the men who were left at home on group dates all hung out together and wrote a song for JoJo. My favorite part of any Bachelor/Bachelorette is when all the contestants start being friends with each other.